Since 2008 with the publication of Fight On #1, the Old School Renaissance has had its own fanzines. The advantage of the Old School Renaissance is that the various Retroclones draw from the same source and thus one Dungeons & Dragons-style RPG is compatible with another. This means that the contents of one fanzine will compatible with the Retroclone that you already run and play even if not specifically written for it. Labyrinth Lord and Lamentations of the Flame Princess Weird Fantasy Roleplay have proved to be popular choices to base fanzines around, as has Swords & Wizardry. Published by The Twisting Stair Partnership, The Twisting Stair is different. Not only in terms of its format—it comes in A4 size rather than the digest size which is standard for most fanzines then and now—but also in terms of the retroclone it is written for. 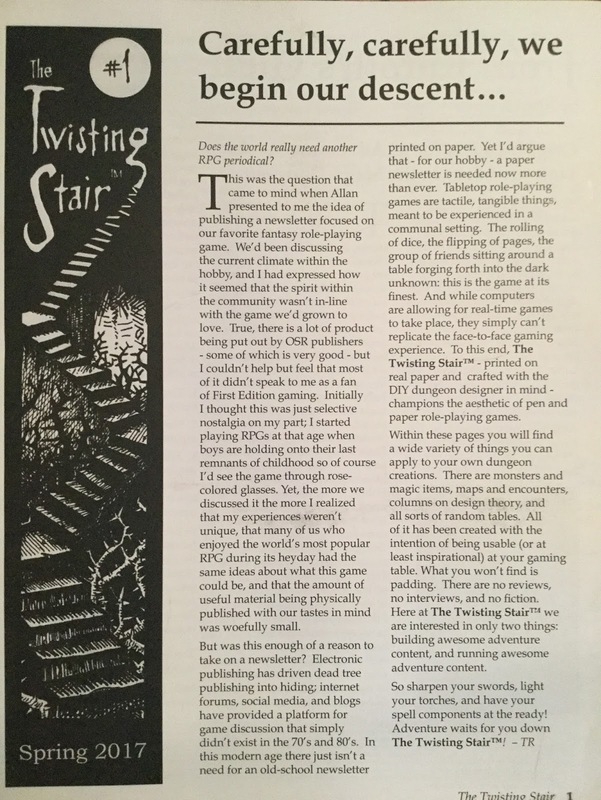 The Twisting Stair is written for use with OSRIC, the Old School Reference and Index Compilation roleplaying game which emulates the first edition of Advanced Dungeons & Dragons. This is of course, the version of choice for retroclones which emulate Advanced Dungeons & Dragons, though the majority of retroclones do derive from Basic Dungeons & Dragons or just Dungeons & Dragons. The Twisting Stair #1 is organised in a simple fashion. Beyond the editorial, it contains just the three articles, penned by Allan T. Grohe Jr. and Tony Rosten. Each writer has his own lengthy column, Grohe’s ‘From Kuroth‘s Quill’ and Rosten’s ‘Down the Twisting Stair – An ongoing exercise in megadungeon design’, which bookend the issue. Between them is the simple ‘Critters & Glitters’, a combined monsters and magic items column. Here in the first issue, ‘Critters & Glitters’ provides an interdimensional, almost Lovecraftian interpretation of the Sasquatch, akin to the Dimensional Shambler, as well as the Ring of Reflection, a magical item which hides the wearer’s Alignment and enables him to cast the spells Mirror Image, Gaze Reflection, and Undetectable Lie, as well as Projected Image and Shadow Door if the wearer is an Illusionist. Of the two, the Ring of Reflection is an item that any Illusionist would want, but the Sasquatch feels underwritten and challenging to use in a game. ‘From Kuroth‘s Quill’ is Allan T. Grohe Jr.’s regular column and opens with ‘Combined Hoards as Adventure Hooks: Treasure Maps in the Mega-Dungeon (Part 1 of 2)’, an examination of the role and use of treasure maps in Dungeons & Dragons. It takes its cue from both Advanced Dungeons & Dragons and Dungeons & Dragons in playing up the frequency of appearance, importance, and use of treasure maps in hoards. This has the potential to set up a chain of treasure maps as one treasure map leads to a hoard containing a treasure map, which leads to another hoard containing a treasure map, and so on. The article explores how they can be used, essentially setting up a mystery or chain of clues that serve to pull the player characters deeper into the game and provide satisfying game play as clues are uncovered and the mystery revealed. It supports this with a set of treasure tables to replace those found in the Dungeon Master’s Guide that place much more of an emphasis on treasure maps. This is a thoughtful article, that perhaps could have benefited from an example or two, but perhaps those might appear in a future issue? 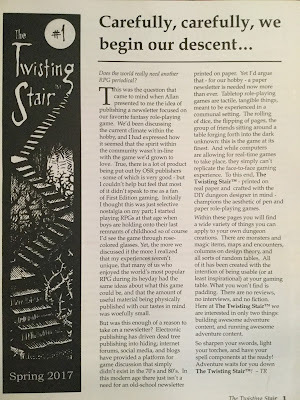 As its title suggests, Tony Rosten’s ‘Down the Twisting Stair – An ongoing exercise in megadungeon design’ explores that singular feature of the Dungeons & Dragons game—the mega-dungeon. The aim of each issue of The Twisting Stair is to present a new, lower level of an example mega-dungeon—or at least a centerfold map of it. There is just not the room in the pages of The Twisting Stair to present a complete level of a mega-dungeon and that is very much a shame. Although the column discusses the nature of the mega-dungeon and the role of the first level, the meat of the article are three mini-maps or geomorphs. These are mini-encounters or dungeon room complexes which can be slotted into the ‘Place Geomorph Here’ blank spaces on the main map. Several more undescribed maps are given, but the three written up affairs are delightfully inventive and challenging which can be encountered again and again. ‘Dolores the Harpy’ details a trap-style encounter with a harpy that looks quite complex, but it makes sense upon a detailed read through and breathes life into a monster which is normally just something to kill. The encounter is perhaps too lethal for First Level characters, so the Dungeon Master might want to tone down the damage inflicted and the reward does feel a little underwhelming. This is followed by ‘The Crypt of 171 Skeletons’, a crypt protected by skeletons which form phalanxes and reform later if destroyed. There is more of a puzzle aspect to overcoming these undead which means that a party could attempt to solve it again and again. The third geomorph is by Allan T. Grohe Jr. ‘Pennies from Hell’ combines reward with danger, an inexplicable font of monies and more, but as the value of treasures it drops, the nature of the accompanying dangers grows and grows. This is one of those odd dungeon features that are just ‘because’ and will doubtless mystify the player characters they move on. All three of these geomorphs are inventive and interesting and the fact that they are included as part of the issue’s mega-dungeon map is all but irrelevant. They can easily be pulled out and inserted into a dungeon of the Dungeon Master’s design with ease, but they also highlight how disappointing it is that the rest of the mega-dungeon is not detailed or described. The authors’ design inventiveness needs to be given a larger platform and a mega-dungeon could be such a platform. Physically, The Twisting Stair #1 runs to just sixteen pages. This, in combination with the larger, A4-size, means that the issue feels a little thin. Had it been digest size, this might not have been a problem as the resulting booklet would definitely be thicker. That said, the larger format allows for a larger, more spacious layout and for larger maps, but more importantly, it allows the publisher to expand the fanzine into an actual magazine should the scope and demand exist for it. This inaugural issue is very lightly illustrated, but it comes with a profusion of dungeon floorplans and these are nicely done, especially the dungeon geomorphs. The writing requires a light edit here and there, but is overall, a very readable first issue. The Twisting Stair #1 cannot escape feeling slim and flimsy and perhaps a little text heavy. Yet, the content is enjoyable and thoughtful and useful. At just four articles, the inclusion of a monster and a magic item feel very much like garnish to the solidly done, longer articles that bookend the issue. Both of these, ‘From Kuroth‘s Quill – Combined Hoards as Adventure Hooks: Treasure Maps in the Mega-Dungeon (Part 1 of 2)’ and ‘Down the Twisting Stair – An ongoing exercise in megadungeon design’ are good meaty pieces that leave you wanting more. Perhaps just too light to really warrant being a single purchase, The Twisting Stair #1 is a fine start, but better value if picked up with The Twisting Stair #2.